Blade: It's time I remind these vampires that the night ain't safe for suckheads. Misty Knight: I thought you and Dracula had a truce? Blade: We do. Me and every other vampire don't. Misty Knight: Why do you hate vampires so much? Blade: They want us all dead. They treat people like cattle. And when you touch 'em, sparkly glitter rubs off on your hands, and it's really hard to wash off. I hate that. Misty Knight: You spend a lot of time on one-liners, don't you? Blade: It gives me something to do while I'm carving stakes. 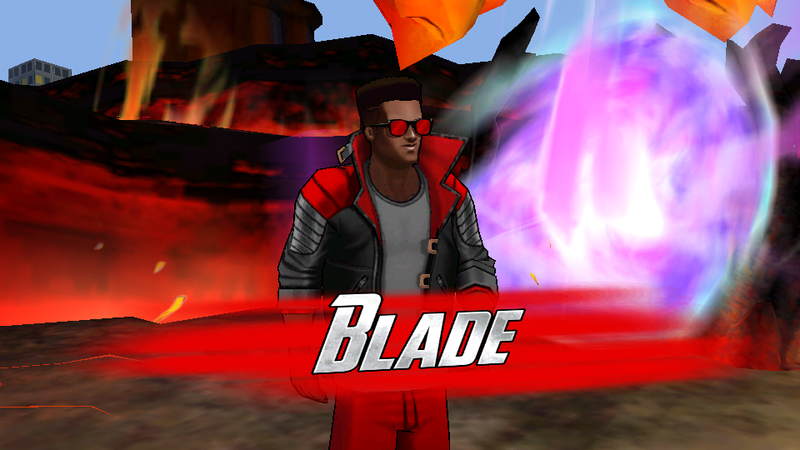 Blade: I heard you're the best at moving with the shadows, and using deadly measures. How'd you like to help me finish off the vampire nation? Blade: Train for battle, and we'll go get these suckheads. Black Widow: Are we allowed to call them that? 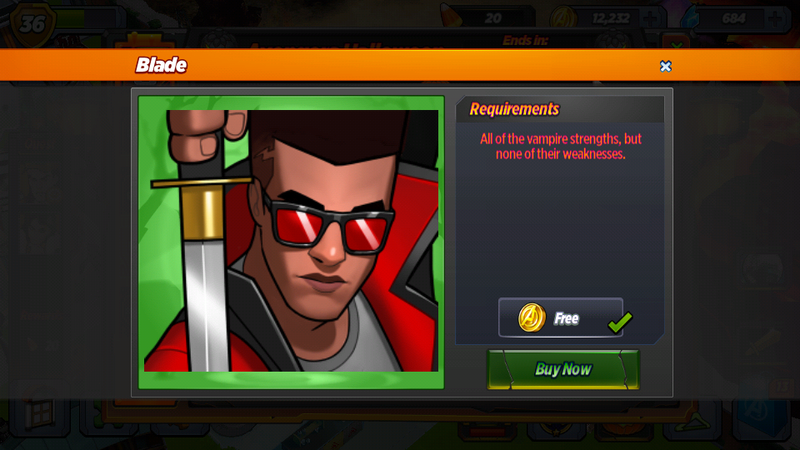 Blade: I'm half-vampire, so it's okay. Festive Black Widow: How are we gonna find all of the vampires? Festive Black Widow: You set some kind of trap? Blade: I spread a rumor through their network that this school is filled with giant bobbleheads. Vampires can't resist oversized bobbleheads. Festive Black Widow: I'm not gonna lie, I'm pretty excited about fighting an army of vampires. Blade: I know what you mean. I've never felt so excited. 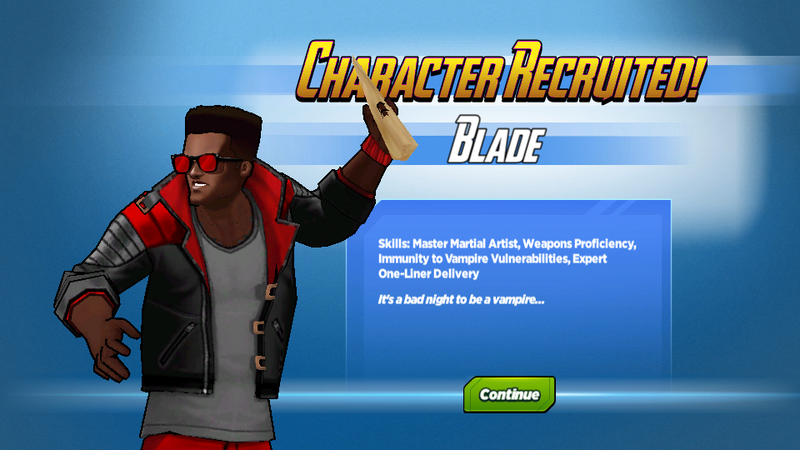 Blade: Nice work. I'll let you know when it's time for phase two. Festive Black Widow: What's phase two? Blade: Finish off these suckheads once and for all. Festive Black Widow: I thought that was phase one? 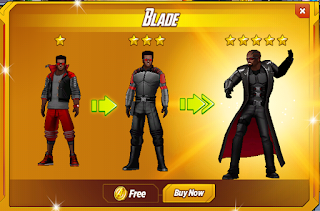 Blade: All the phases are the same. I separate 'em out to provide myself with a greater sense of accomplishment. Pirate Wasp: Hey Blade! I'm Wasp! Black Widow grumbled something about hunting vampires with you, and I totally wanna join the crew! Blade: You ain't cut out for this life. Pirate Wasp: You don't think I'm tough enough?! Blade: You're too nice. When you step into a roomful of vampires, it's kill or be killed. You have to be ruthless. Merciless. It ain't pretty. Dracula: We have a truce, Blade. My vampires only want to live in peace. Blade: I'd rather see 'em in pieces. Dracula: What will you do when every single vampire is dead? Blade: Open a frozen yogurt shop. Nick Fury: Dracula is serious about him and the vampires changing their ways. My guys say there hasn't been a vampire attack in weeks. They're even working on a version of the synthetic blood serum you use. Blade: You a vampire gossip columnist now? Nick Fury: All I'm saying is that if they can change, maybe you can too. What do you think of Blade? Were you able to recruit him?